Prime Minister Justin Trudeau speaks during the 72nd session of the General Assembly at the United Nations in New York on September 21, 2017. Prime Minister Justin Trudeau used his address at the UN General Assembly Thursday to shine a light on a dark aspect of Canada: the story of this country's Indigenous peoples and their challenging relationship with the government. In his second-ever address to the United Nations body, Mr. Trudeau said that "Canada remains a work in progress," pointing to the struggles Indigenous peoples have faced from the times of colonialism through today. He emphasized the government's responsibility to improve that relationship, saying the world has a similar duty to respond to global challenges, such as inequality. "For First Nations, Métis Nation and Inuit peoples in Canada, those early colonial relationships were not about strength through diversity, or a celebration of differences," Mr. Trudeau said. "For Indigenous peoples in Canada, the experience was mostly one of humiliation, neglect and abuse." 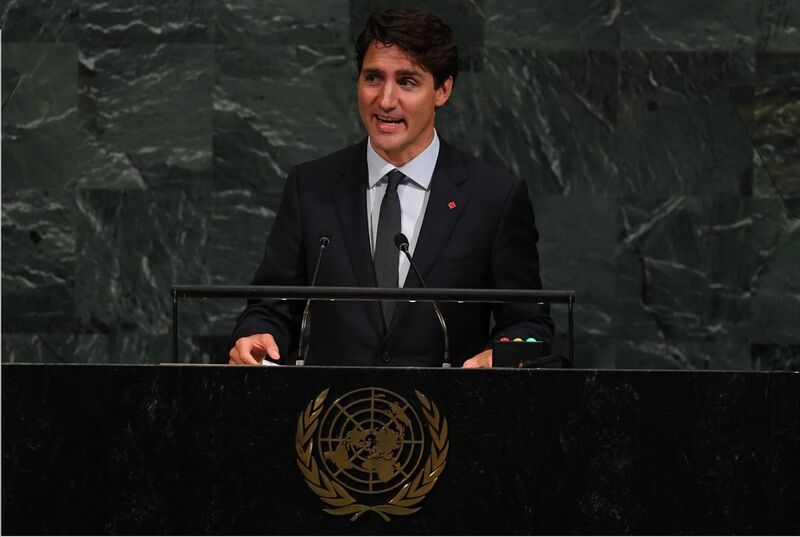 In a speech to the United Nations General Assembly, Prime Minister Justin Trudeau outlined a path to reconciliation between Ottawa and Indigenous peoples, and reiterated Canada's commitment to combating climate change. Mr. Trudeau used his star power to draw attention to what he called "Canada's shame" on the global stage. He said the government's attempt to seek reconciliation with Indigenous peoples can act as a lesson for the world, positioning Canada's bid for one of the 10 rotating, non-permanent seats on the UN Security Council in 2021-22. "We can't build a better world unless we work together, respect our differences, protect the vulnerable, and stand up for the things that matter most," Mr. Trudeau said. "But I remain confident – for Canada's experience shows this to be true – that any challenge can be met if we meet it together." Speaking to reporters at the UN after his speech, Mr. Trudeau said he chose to focus on Canada's relationship with Indigenous peoples because he wanted to show the world that the government can take responsibility for the "terrible mistakes" it made in the past. "A number of times in conversations over the years, when I have suggested that certain countries need to do better on their own human rights, on their own internal challenges, the response has been, 'Well tell me about the plight of Indigenous people in Canada.'" Mr. Trudeau spoke about the "legacy of colonialism in Canada" in his address. He highlighted the lack of safe drinking and bathing water in Indigenous communities across Canada and then pointed to the government's elimination of more than two-dozen boil-water advisories and its plans to end those that remain. He spoke about the youth suicide epidemics on some reserves. "There are Indigenous parents in Canada who say goodnight to their children, and have to cross their fingers in the hopes that their kids won't run away, or take their own lives in the night." Citing what Amnesty International has called "a human-rights crisis," the Prime Minister described the violence "far too many" Indigenous woman and girls face in Canada. And while the residential school system is "a thing of the past," Mr. Trudeau said many Indigenous youth are still forced to move far away from their families for a basic education. Indigenous leaders said Mr. Trudeau needs to match the words in his UN speech with action. "There's been a lot of public platitudes and eloquent statements about the need to move forward – but aside from the sizzle, there's not a great degree of substance," said Grand Chief Stewart Phillip, president of the Union of BC Indian Chiefs. Mr. Phillip also referred to recent submissions to the UN Committee on the Elimination of Racial Discrimination, in which groups expressed concerns about Indigenous people in Canada. Ottawa is a signatory to the convention and must report to the committee every two years. The UBCIC submission said, "we are presently witnessing a great divide between the words of the Canadian government and its actions on the ground," citing concerns including land title, housing and energy and mines in relation to Indigenous people. Cindy Blackstock, executive director of the First Nations Child and Family Caring Society, sounded the alarm about discrimination against Indigenous children. "My ongoing concern is that, that language doesn't translate into real changes in the way the government of Canada conducts its relationships with First Nations children," she said. Ms. Blackstock launched a human-rights action against the federal government over its funding of child-welfare services. In its 2016 decision on that challenge, the Canadian Human Rights Tribunal found Ottawa racially discriminated against youth in its delivery of child-welfare services on reserves. Negotiations on how to address that gap are continuing. "We are still at a point where Canada is out of compliance with four legal orders to end discrimination on First Nations child welfare," Ms. Blackstock said, referring to orders from the human-rights tribunal. During his speech, Mr. Trudeau linked the challenge Indigenous peoples are facing – especially in northern Canada – to climate change. He said Canada remains committed to its international commitments on this front.